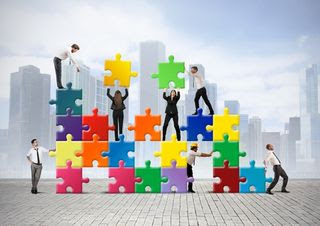 Got Comfortable Workplace Collaboration Puzzle Pieces? You are here: Home / Collaboration And Convergence / Got Comfortable Workplace Collaboration Puzzle Pieces? Are you the right puzzle piece needed to fulfill your organization’s comfortable workplace collaboration strategy? Or does the phrase comfortable workplace collaboration make you uncomfortable? Many organizations of all sizes pay lip service to workplace collaboration. Leaders describe groups of employees working together as “collaborative teams.” Realistically, these teams represent anything but a high-functioning group of engaged employees targeting the creation of remarkable client outcomes. On the other hand, sometimes employees are equally unrealistic about how they fit into the strategic organizational puzzle. As a result, they rate themselves as being collaborative as long as they are in control of their output. However, when placed in a challenging, dynamic and innovative environment requiring being comfortable with being uncomfortable collaborating, they self-marginalize rather than actively engage. First, comfortable workplace collaboration requires unbiased, complementary puzzle pieces. Are you comfortable when collaborating, or aren’t you? Some of you will start thinking about all the people you work with: the ones you enjoy and the colleagues you just straight up cannot stand. Some of these people may be your managers and leaders. Perhaps one of these individuals is you. As a result of your discomfort, you become unconsciously (or obviously) biased towards specific individuals. Consequently, your biases and baggage make working with you just as uncomfortable as you perceive working with your professional peers. Us versus Them mindset is your standard operating process. Consider the toll of your professional discomfort on your team’s productivity and profitability. After all, you drag your biases and baggage into the workplace each day. Some of you take this bias and baggage home with you each evening. What constructive, collaborative actions can you take to contribute to an organization focused on comfortable workplace collaboration? Next, consider whether comfortable workplace collaboration is achieved only within a specific type of problem-solving puzzle. On the other hand, others of you reading this blog post define the phrase, comfortable collaboration, very differently. For starters, the manner in which you collaborate can make many employees outside of your professional discipline extremely uncomfortable. Why? Because you and your highly collaborative team’s idea of comfortable collaboration incorporates skepticism, debate and validation into every project. Because your team is comfortable with this collaboration style, they create remarkable client outcomes which are both cautious as well as innovative. However, when it comes to collaborating outside your professional discipline or with employees less skilled or educated than you are, team dynamics become disjointed and unproductive. Under those conditions, you are not very comfortable at all. Have you considered constructive, collaborative actions to contribute to an organization focused on multi-disciplinary, cross-functional and comfortable workplace collaboration? Then, ponder why employees find your organizational culture inconducive to comfortable workplace collaboration. As an employer, consider whether you consciously, or unconsciously, make it uncomfortable for employees to work for your organization and thrive in the workplace. Are you simply hiring warm bodies to preserve your organization’s cultural status quo? As a result, do new hires thrive when placed in legacy workplace environments which make them feel trapped or limited? Or perhaps you are attempting to execute human capital strategy more in sync with digital innovation and transformation of the workplace. Except that leadership and departmental skills gaps make executing strategy wishful thinking. Also, hiring employees is only a small piece of the corporate cultural puzzle. Is your organization focused on incorporating the learning culture puzzle pieces essential for collaboration for transformation and innovation? Then again, are hiring strategies too homogeneous, non-diverse and not inclusive enough to promote healthy and comfortable workplace collaboration? Is your organization leveraging or stifling collaboration for professional innovation and workplace engagement? Comfortably innovative workplace environments are anything, but homogeneous. Instead, they are disruptive and dynamic. However, to grow, expand and sustain your business, you must have the right comfortable workplace collaboration puzzle pieces in place. As an employee, how would you assess the difference between the environment you want to work in compared with the environment you currently need to work in? Similarly, organizations who feel they are poised to move to the next level often realize they have unrealistic expectations from their current workforce’s competencies to execute expansion strategy. Would you like to put the puzzle pieces together differently, for your own professional development? Contact me. Let’s start our dialogue, today. Babette Ten Haken is a corporate catalyst and innovative speaker. She serves organizations as a strategist, coach and storyteller. Babette’s One Millimeter Mindset™ Workshops and Speaking programs leverage collaboration to catalyze professional innovation, workforce engagement and customer success for customer retention. Babette’s playbook of technical / non-technical collaboration hacks, Do YOU Mean Business? is available on Amazon.